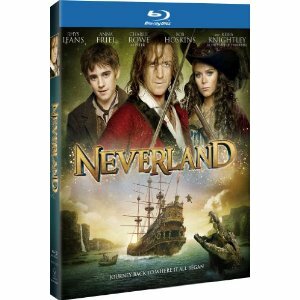 WorldMovieStore - Neverland Sinopsis. Originally produced as a two-part miniseries, writer-director Nick Willing's story starts off as a niftily cockeyed take on Oliver Twist, with a turn-of-the-century Peter (Charlie Rowe) being trained in the art of grifting by fatherly mentor James Hook. (The decision to reimagine Hook's eternal nemesis as an eight-legged Apatosaurus-sized supercroc doesn't help matters, either.) Cue the tick-tocks, happy thoughts, and handclaps. --Andrew Wright. Read More Sinopsis. 0 Response to "Blu-ray Release Neverland"